In our column ‘A Day In The Life Of’, we are trying to step into the shoes of the awesome techies from various organisations who are working in Emerging Tech areas like big data, data analytics, artificial intelligence and the internet of things, among others. 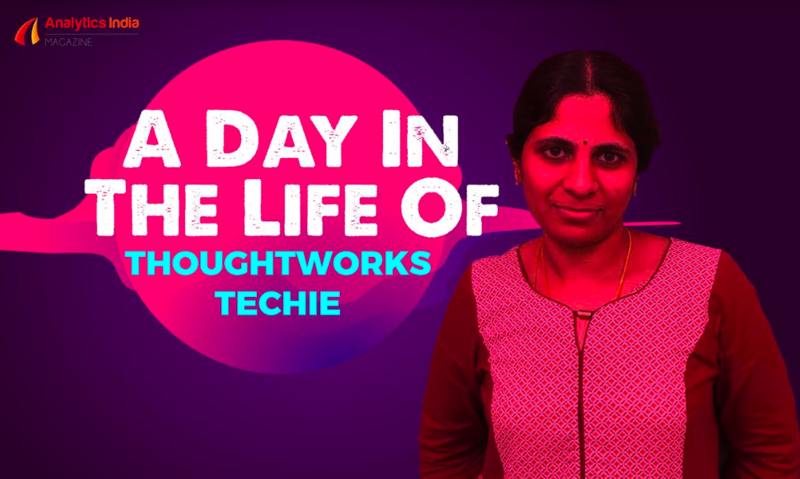 This week Analytics India Magazine decided to talk to Kaleeaswari Somasundaram an Application Developer at ThoughtWorks, about her life as a dedicated techie who is working in a top company, in an area which is constantly changing and evolving. Describing her job as “unblocking a blocker” Kaleeaswari starts her day at 6:00 am, and begins her work by clearing her inbox. “By the time I’m done, it’s time for the project team standup [meeting] where we talk through completed tasks, blockers and what we intend to complete over the day,” she says. Efficiently juggling work and upskilling, Kaleeaswari tells us that she spends her day active on developments, conversations on technology and businesses implementations and experiments that tech groups, both, inside and outside ThoughtWorks, are running. Given the hiring pace that ThoughtWorks maintains, on most days, there are a few interviews for Kaleeaswari to carry out. “I also spend my time with the learning and knowledge sharing groups that are a big part of the ThoughtWorks culture. These include external-facing technology and networking events or our internal facing office-wide standups. The latter is conducted both at a national and city-office level and are an opportunity for the larger group of employees to stay informed on and contribute to important issues, policies and activities that matter to my company,” she adds with a content smile. Kaleeaswari, who loves cooking and tries out new recipes, tells us a little more about the project she’s working on. “I am currently working on an internal project at ThoughtWorks and am on the team that enables revenue-related business decisions at the company. It’s hugely data-driven, and my project-related daily activities include a lot of dev-huddles, coding, design and architecture discussions. This all is apart from the office-led activities that I am also a part of,” she says. When asked about the best part of her workday, Kaleeaswari says that it’s definitely “unblocking a blocker”. “It’s a total high-five moment when the team and I are able to find a solution to a problem that we have been breaking our heads about! I also feel great when I contribute with meaningful and valid inputs during tech-huddles. All these small and big moments add to making my day at work great,” she says happily. Painting a vibrant picture of the ThoughtWorks working environment, Kaleeaswari says that the company is very are conscious of how important a good work-life balance is. “Personally, I also make an effort to not drown myself in work but take a healthy interest in other activities like cooking that actually helps me be more creative at work,” she says. However, not everything goes according to plan every single time. “It does sometimes happen that there are knowledge sharing sessions or technical workshops that I am either running or want to participate in which eats into some of my personal time. There are also occasions of production issues that are urgent and have to be dealt with immediately, especially closer to or during go-live or deployment times,” she says. When asked about her five-year plan, Kaleeaswari says that she wants to learn new things and acquire new knowledge in any and every role at work. “In five years, I would like to lead a team, putting what I have learned as a team member, into action and adopting new skills like mentoring and people management,” she adds. But for now, her immediate goal is to work on as many different tech stacks as possible and build on her existing technical experience. “I am also focussing on getting a better handle of engineering and design with adequate business context. This is so I can contribute to solutioning and conversations with the team, with a solid understanding of the business and the challenges that we are trying to solve using technology. Finally, I am working on organising, participating in and coming up with interesting women-centric tech events that will encourage more diversity and inclusivity within technical circles,” she says, signing off.